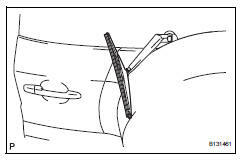 Rotate and remove the cap as described in the "remove" procedures. Raise the arm and blade. 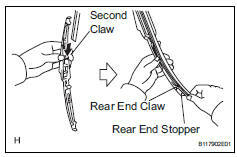 Raise the wiper blade to the position where the claw detach with a ''click'' sound, as shown in the illustration. Be careful not to damage the claw. 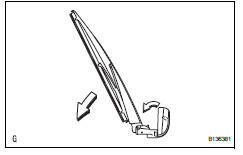 Pull the wiper blade straight toward the left side of the vehicle to remove it from the wiper arm. 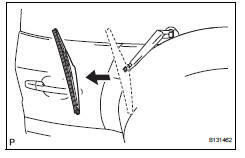 Do not fold the wiper arm with the wiper blade removed. The arm tip may damage the back door glass surface. 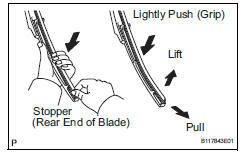 Lift and pull the end of the wiper rubber protruding from the blade stopper as shown in the illustration. Do not forcibly pull out the wiper rubber. The backing plates will be deformed or the blade claws will be damaged. Lightly pushing the rubber between the ends and middle will allow it to be removed more easily. Install the no. 1 And no. 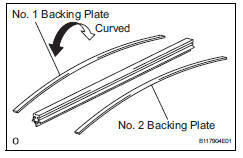 2 Backing plates as shown in the illustration. Install the backing plates facing the correct direction. 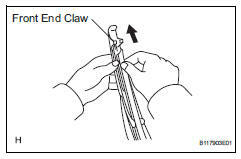 Insert the wiper rubber from the front end of the wiper blade to the rear end through the second claw. 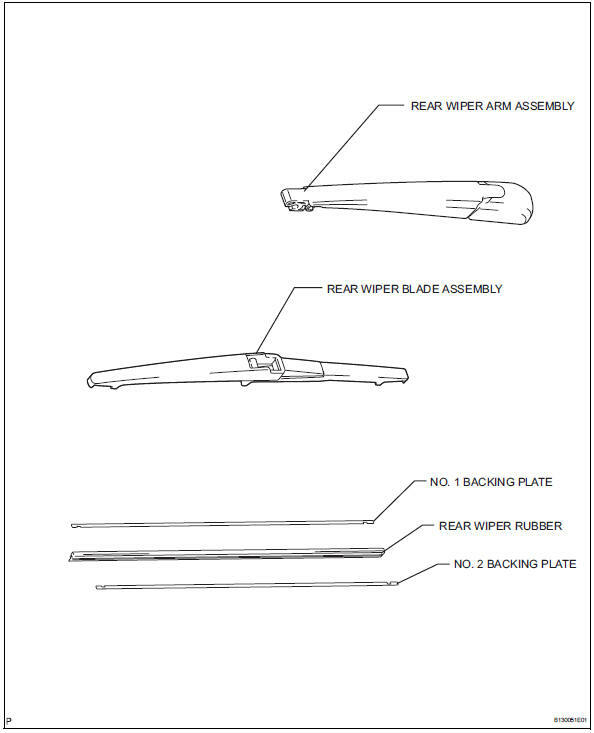 After pushing the wiper rubber through the rear end claw, allow it to stick out from the rear end stopper. Slide the wiper rubber through the front end claw. 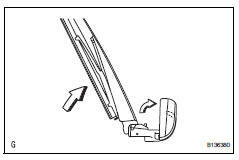 Push the wiper blade straight toward the right side of the vehicle to install it to the wiper arm. 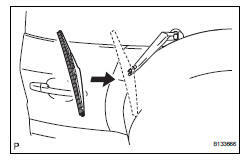 Lower the arm and blade. Rotate and install the cap.